The LA Rock ‘n’ Roll series hosted its 4th annual race this past weekend in downtown LA, featuring a Half-marathon and Mini-marathon (3.5 mile untimed run). Taking place on Halloween weekend, the race definitely brought out some wonderful costumes. I saw everything from a guy riding an ostrich, to several participants of Mario Kart and a plethora of superheroes (DC and Marvel). My hat is off to the lady sporting the Milla Jovovich “Leeloo” tape outfit from THE FIFTH ELEMENT…beware of chafing. The officials said there were 13,000 people running, although according to results board the half marathon had about 7300 finishers. The weather was overcast, but not too cold…actually really good running conditions. 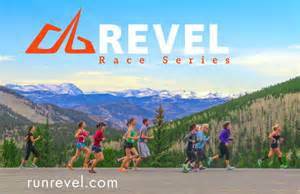 Here’s my review about the race’s various components…enjoy! The Rock ‘n’ Roll series races tend to be a little pricier than local races, but that extra cost typically shows in the good organization of the race (Las Vegas Rock ‘n’ Roll 2011 being a horrible exception). So, save yourself some bucks and register early…or you can wait and on the 13th of each month they typically have a $13 discount on Facebook (Like ‘em and tell ‘em Scott sent you). The packet pick-up was located at the LA Convention Center on Friday and Saturday (typically no race day registration) and was easy to navigate. Your swag came in a re-usable orange backpack/bag (Halloween colors y’all) and there were plenty of vendors to get your fill of running gear and free samples. One bit of advice, save your $15 for Convention parking and look for street parking. I found a meter 5 blocks away and spent a measly $2…and then used the savings to drop $10 on an overpriced LA Rock ‘n’ Roll logo beer glass. Since the race was located in downtown LA, there were plenty of parking options available…from LA Live, to the convention center to other lots in the city. Rates were anywhere from $10-$20 depending on where you choose to park. I decided to go the Metro Rail route, parking at Universal City and for the cost of a $5 day pass ($6 if you need to buy a TAP card) took an easy trip on the Red Line that let me off blocks from the start line. Rock ‘n’ Roll knows how to do their bling. While I was expecting a black-colored shirt (it was Halloween weekend after all), the blue shirt certainly didn’t disappoint, sporting a very cool “skull” themed logo. 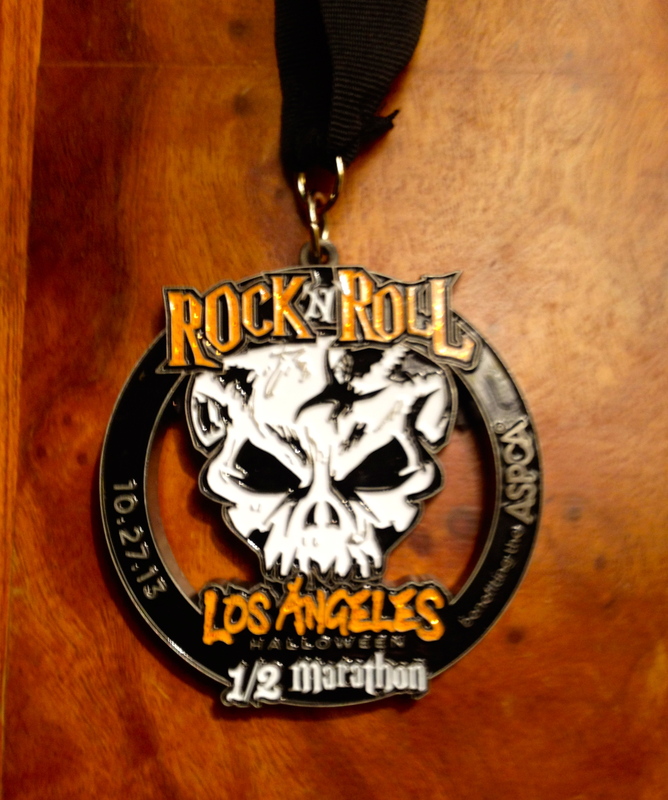 The finisher’s medal was equally well designed (had some real heft to it) also showing off the skull logo. And those who run multiple Rock ‘n’ Roll races in a single calendar year get additional medals. It’s a win/win as the company gets more racers and in turn the runners get a little additional bling for their loyalty. The course was a back & forth route starting at the Staples Center and traversing the streets of downtown LA. It featured a loop around the LA Coliseum before heading back near the start line and traveling north, through the 2nd Street tunnel, traversing Figueroa and Flower before heading east and over the famed 6th Street bridge. Then it was a turnaround at the end of the bridge (just before a rock stage) and back to the finish line, right near where you started. The course was mostly flat with a few exceptions (around mile 6 and of course the bridge). I’m typically not a big fan of back & forth routes (running in one direction while you see other runners going in the opposite direction) but there were so many costumes, I didn’t mind. One thing worth noting for you GPS wearers…you will lose your satellite connection each time you go through the 2nd Street tunnel. *NOTE: Here is my lone big complaint with the race. It seems like the course itself was not measured properly and was actually longer than 13.1 miles (at least an extra .1 mile). I typically run tangents and don’t swerve, so I add very little distance to my race (usually no more than .1 miles for a half marathon). For some reason, around mile 10 we suddenly seemed to be a full .15 miles off. My end GPS had the race listed at 13.35 miles. I checked this out with at least a dozen other veteran runners and they all had the same results and concerns. LA Rock ‘n’ Roll should check this out. Thumbs up to LA Rock ‘n’ Roll for the abundance of porta potties (and plenty near the starting line)…other races could learn from you. The course was very well marked and had plenty of support staff. Water stops were every mile with Gatorade every other mile. I know some people were initially concerned with the water tanks/hoses they used to fill the cups (sanitary reasons), but I never saw a shortage of water nor heard of any problems during or after the race. I also like that they had a table at one point in the middle of the race with salt packets (something many runners overlook…don’t mess with hyponatremia). Oh, and since it’s a “Rock ‘n’ Roll” race, the course is lined with numerous local bands belting out high energy tunes. The Rock ‘n’ Roll series also knows how to wrap up a race. After getting your medal and obligatory “finisher photo” taken, we were shuffled off to the vendors for some much needed post-race goodies. From water, to fruit, carbs, chocolate milk and Gatorade there was plenty to quench your thirst…my favorite were the little Jamba Juice samplers…they really hit the spot. Two things of note were missing. The first is Mylar blankets…once you hit October, things could get cold so a Mylar wrap would have been a nice touch. The other is a more personal gripe. Nothing minimizes the joy of post race snackage than not having a bag to put your food in. I asked officials and they said “Well, that keeps people from taking too much stuff.” Really? I’ve been at plenty of races that give out bags or have the snacks pre-wrapped in a bag. My final solution, I went to the souvenir tent and bought a luggage tag for $6 just so I could get a bag (they wouldn’t give me one without a purchase, I asked). I would have liked my free Ultra beer, but there were too many other thirsty people to warrant the long wait outside the beer area and I didn’t bring my ID (another thing that could be handled a little better). The post party was enjoyable as Cracker was the headline band on the stage outside LA Live. I would have stayed for their whole set but I was sweaty, a little cold and had a Metro Rail to catch. All nitpicky gripes aside (except for the distance thing), the LA Rock ‘n’ Roll is a really well put together race and a worthy addition to any half marathoner’s race schedule. Hey Scott. Found you through the Half Fanatics Facebook (or maybe you found me . . . whatever). Loved the RnR L.A. race (I’m a big fan of the series in general . . . doing AZ this weekend). I too noticed a bit of a discrepancy in the distance which actually bums me out a little bit because that race is my PR (1:54:28, thank you very much). Really enjoying your blog here, and maybe we’ll cross paths someday. I’ve got Surf City (full), SD Half, and RnR San Diego in the immediate future. Take care! Hi Chris… thanks for the blog kudos. I have found several races of late where their distances seem to be a little long. It can be a little frustrating when you’re going for a PR (congrats on your PR, btw). And for those of us who run tangents, it’s a little hard to blindly accept that they didn’t make a miscalculation. Break a leg (figuratively) on the Arizona R ‘n’ R. I’m going to get the 3-pack this year to run SD, LA and Vegas. And I will be at Surf City (5th anniversary of my first half marathon) and meeting up with fellow Fanatics. So, let’s plan to connect.